The Snow Apple or Fameuse (also known as: Snow Chimney, Chimney Apple, Red American, Royal Snow, Pomme De Neige, or Chimney Point) is aptly named for both the fruit’s white flesh and the tree’s winter hardiness. Tolerating cold winters, it is well-suited to northern climes. An unknown disease or severe cold snap killed almost all the trees in the 1860s. Following the demise of the Quebec line, the Snow Apple fell into obscurity and is rarely grown today. The Snow Apple is one of the oldest known apple varieties on record, most likely originating in France in the late 1600s (1650-1699), although some European pomologists claim its origins were in Canada. Its start in North America may have been a seedling orchard from seeds brought from France (one of the few apples that often reproduce true to variety from seed). This variety (Malus domestica) was noted in Canada in 1739 and was first introduced to the United States that same year. Snow Apples were found in almost every French settlement in the late 1700s and were the most commonly cultivated apple in Quebec for over 100 years. The distinctive bright ‘snow white’ flesh can also be a pale pink, red, red-flushed, or pale-yellow and/or can have a red streak or occasional crimson stains near the skin. (My father would reminisce about eating Snow Apples with pink flesh, on his paternal grandparents’ farm, saying the redder the flesh, the colder the winter to come). The skin is crimson with green stripes. 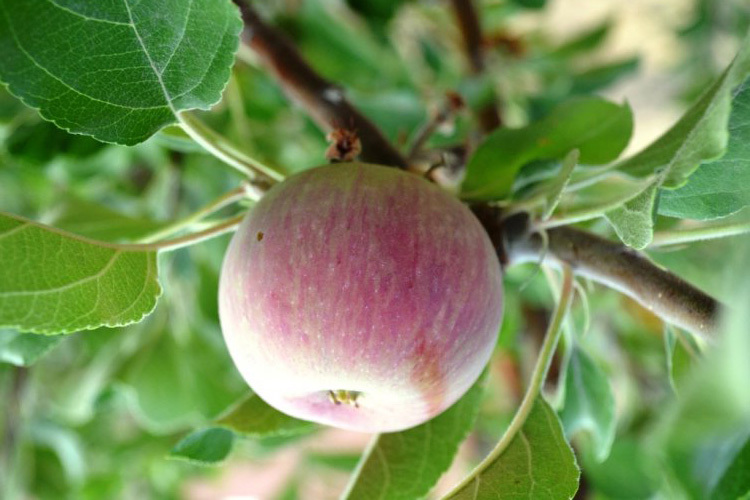 This apple is small to medium in size and ripens in early fall (late September to early October). The Snow Apple is very sweet (sub-acid), tender and juicy, with a nice crisp and a smooth sweet wine-like flavor and strawberry-like aroma, making it good for apple cider because of this aromatic and distinct flavor. Storage is fair, one to two months, so apples are best eaten fresh or used for baked goods or sauce. The tree has heavy branching so needs regular pruning. Without early thinning, it tends to produce a heavy crop biennially. The Snow Apple is very mildew resistant, and has some resistance to both bacterial canker and fire-blight, although very susceptible to scab. A probable ancestor, the McIntosh apple, is a cross between the Fameuse and the Detroit Red and was discovered by a Canadian farmer around 1800 who gave his name to the variety. See this sign and other related items at an Orchard Lake Museum Open House, the second Sunday of each month, from 1-4 p.m.